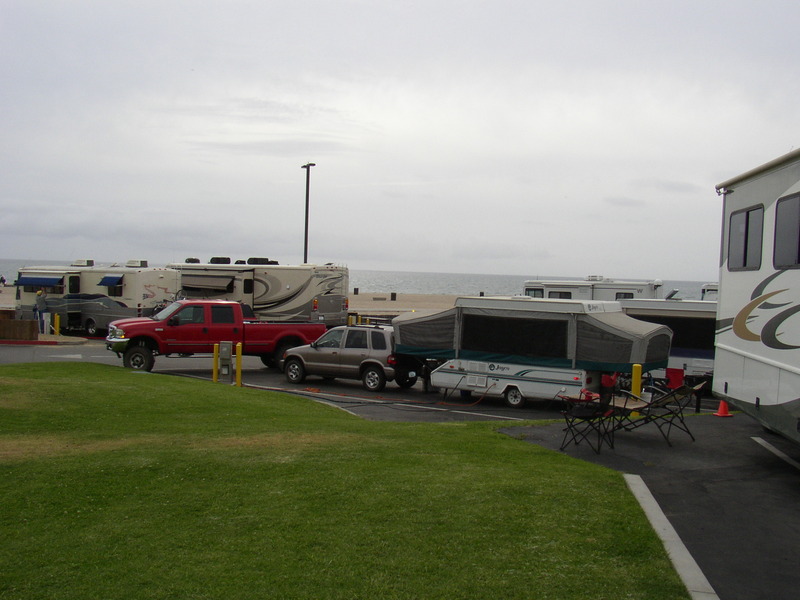 Our second trip is over, and I’m sitting here in my condo only about 7 miles away from the Dockweiler RV Park, wishing it was still going. 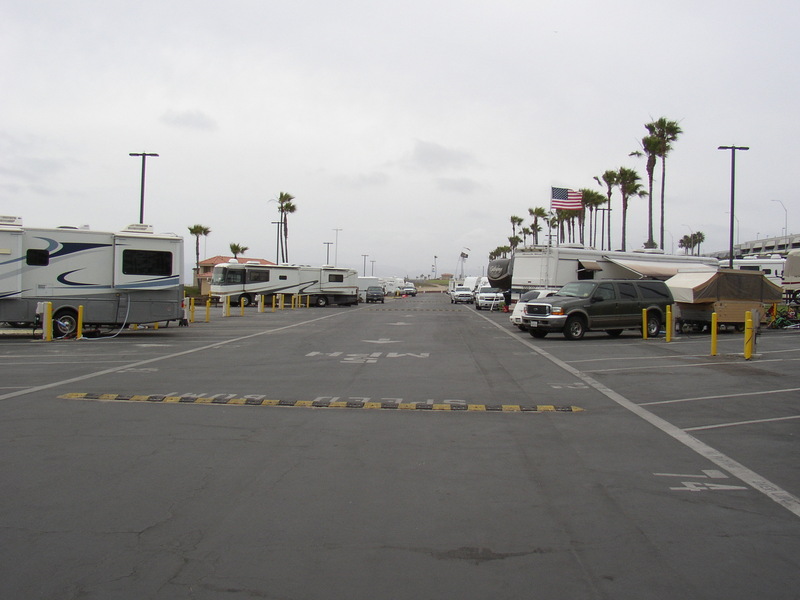 To get back into it, I would have to drive 66 miles inland to pick up our coach from the storage yard, and then drive about 70 miles in the coach to get back to Dockweiler. Compared to a 300 mile driving day, it’s not too bad, but it’s still more than a hop, skip, and jump. Guess I’ll just have to stay home for now. 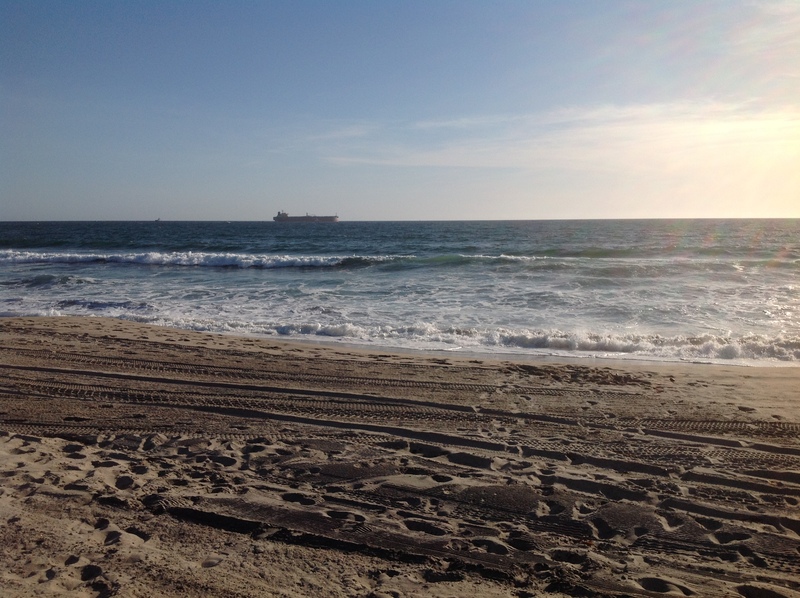 Dockweiler has some features that are hard to love. It’s very close to LAX, and depending on wind patterns and the time of day, you might have noisy jets taking off right over your heads every few minutes. It can get loud enough to stop conversation. You can just see the jet taking off from LAX – middle left. 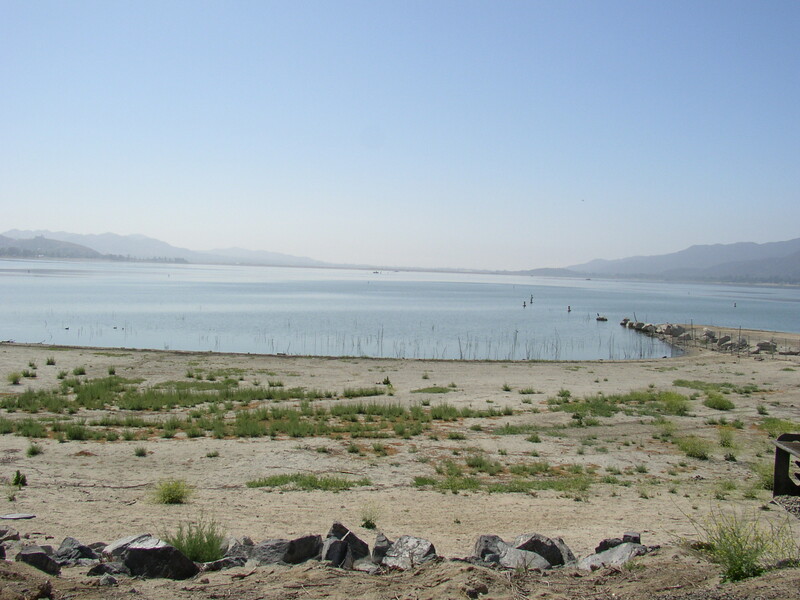 Across the road, and visible from the RV Park, is Hyperion – LA’s oldest and largest sewage treatment plant. Off shore, oil tankers tie up and connect to pipes that take crude oil into the Standard Oil Refinery, which is a mile or so south. Cost is high – $65 per night for the row closest to the sand, $60 per night for the middle row, and $55 per night for the back row. The park isn’t lushly landscaped and attractive, either. At first glance, the park just looks like a parking lot with hookups. It is long and skinny, with three rows of spaces. 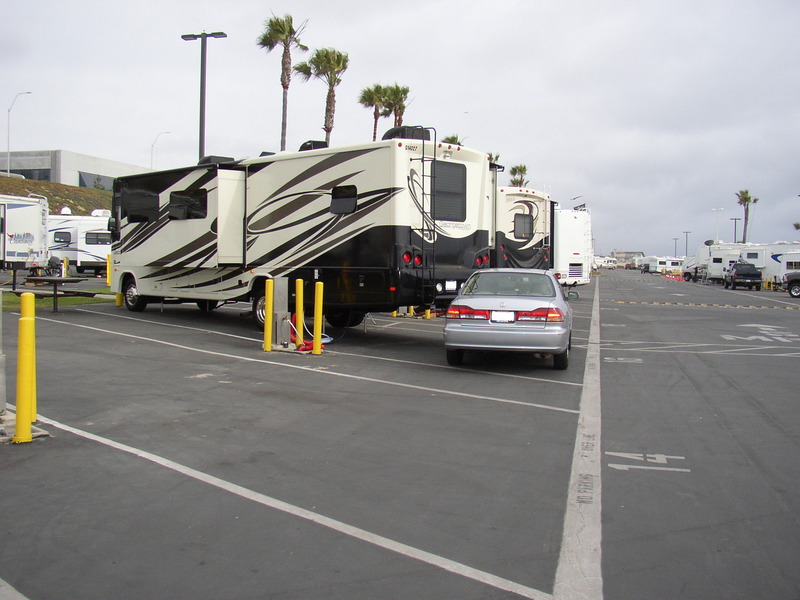 It’s not a tiny park….there are 118 spaces. You can see the three rows of spaces here. It goes pretty far back….118 spaces. 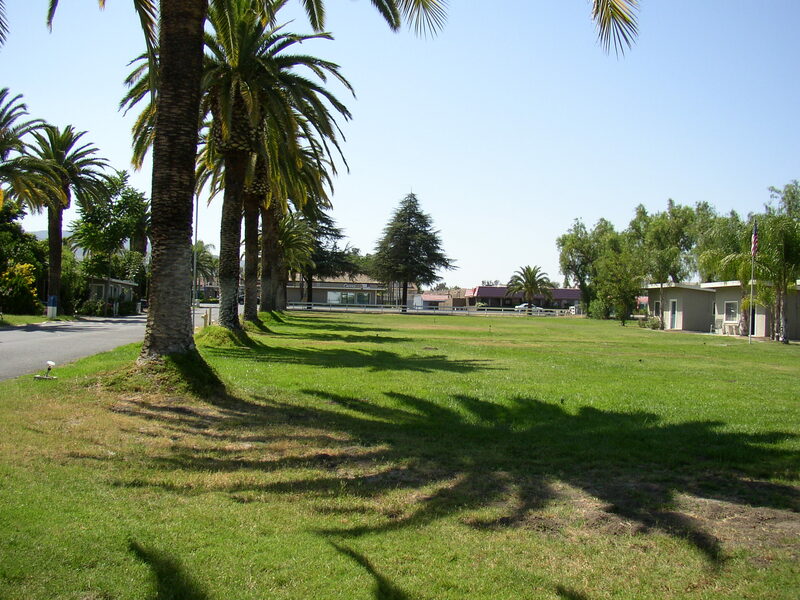 This is a very popular park, especially in the summer. It fills up fast. Reservations are required. Why is that, with all of the problems? Most of the bad features don’t actually impact you much. There is a breeze that normally blows from the ocean onto the shore. 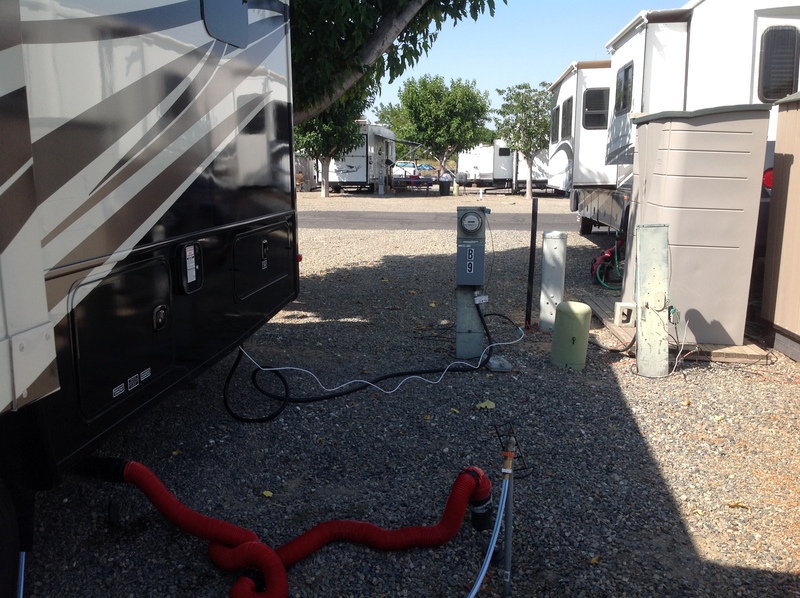 This usually insures that the smells from Hyperion, LAX, and Standard Oil don’t hang around in the RV park. 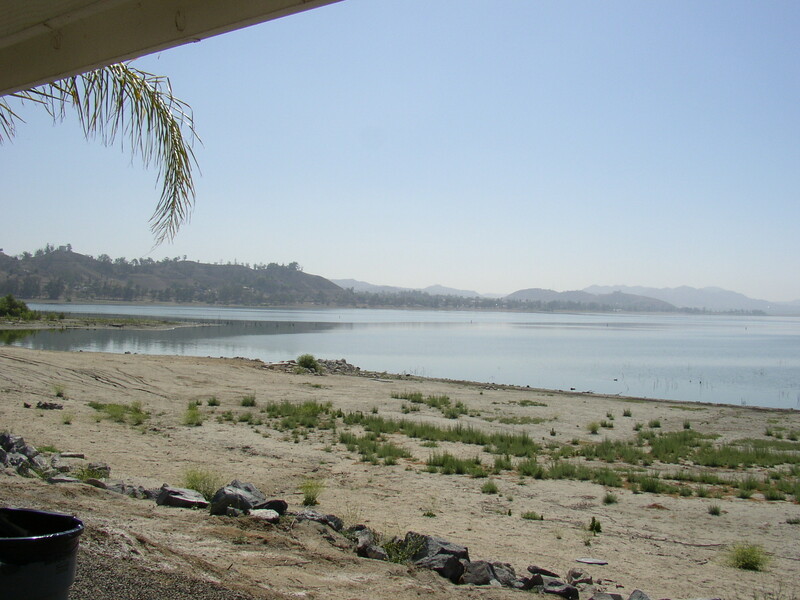 The smells generally blow inland. You get nice clean ocean air. The airplane noise can be bad, but it comes and goes, and after a while I don’t notice it very much. 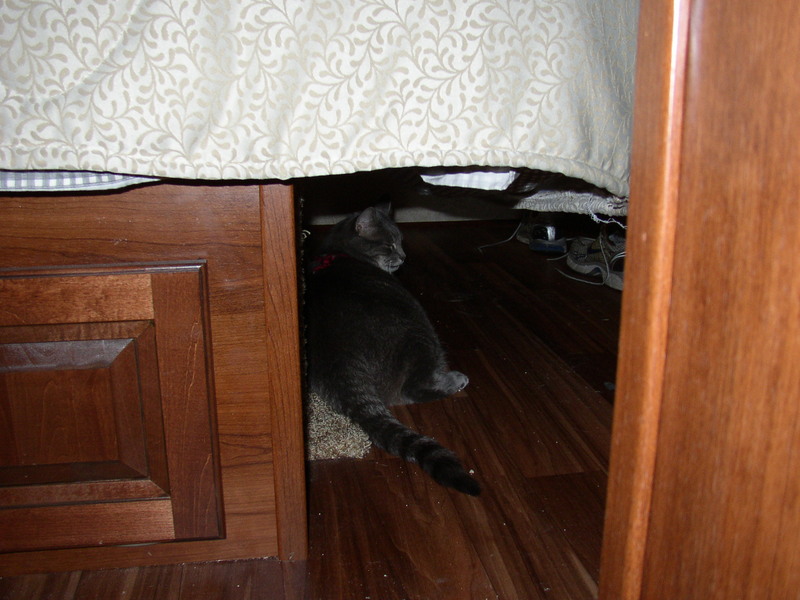 Laura doesn’t agree with me on this…..she thinks the noise is a really big problem. The best part about this location is the bike path. Its about five steps from the first row of spaces at the park, separated by a low fence with openings about every 15 feet or so. 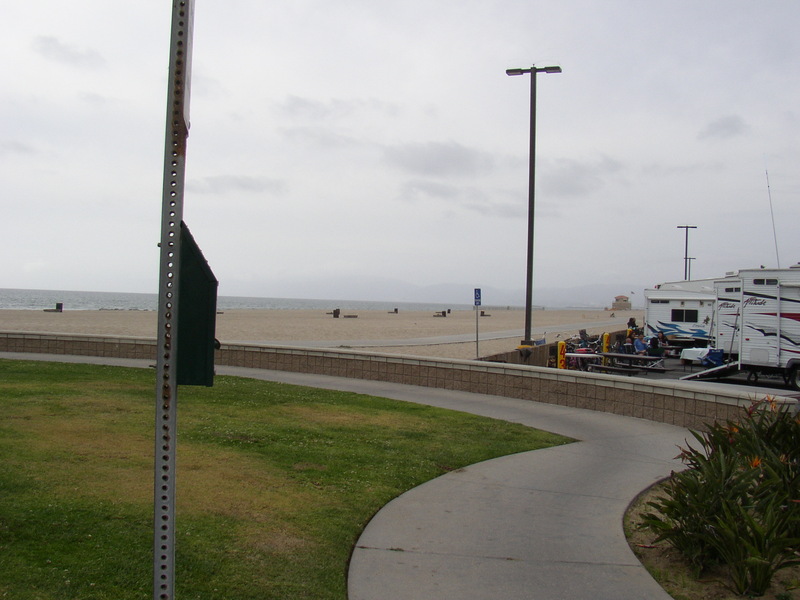 This bike path is the famous “Strand”, which runs through Torrance Beach, Redondo Beach, Hermosa Beach, Manhattan Beach, El Porto, Playa Del Rey, Venice Beach, and Santa Monica Beach. The food, drink, and entertainment selection along the Strand is ENORMOUS. World class. Almost everybody I saw at this campground had bikes in order to take advantage of this. The Strand. You can just see a bike entering the frame on the right. 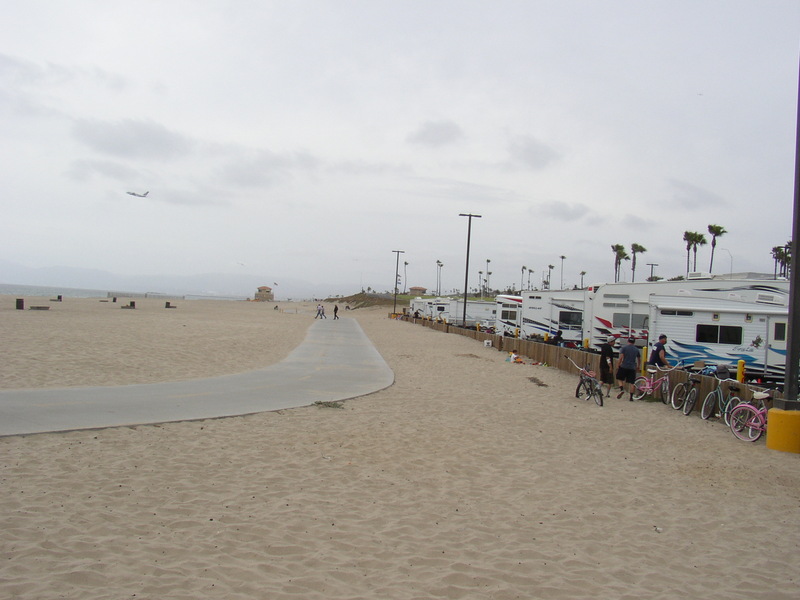 The beach next to the RV Park is very nice also. If you like to body surf, it’s a very nice location. 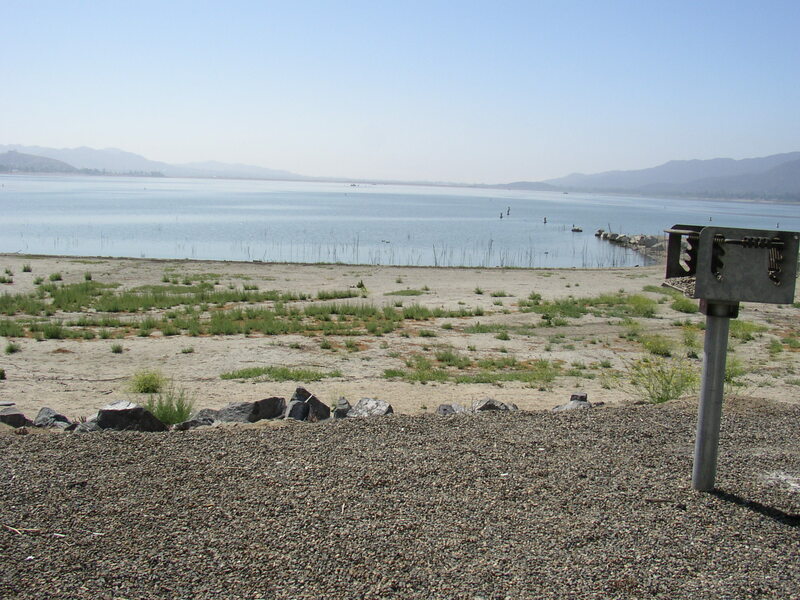 It’s also a good place to fish. There never seems to be many local surfers there. 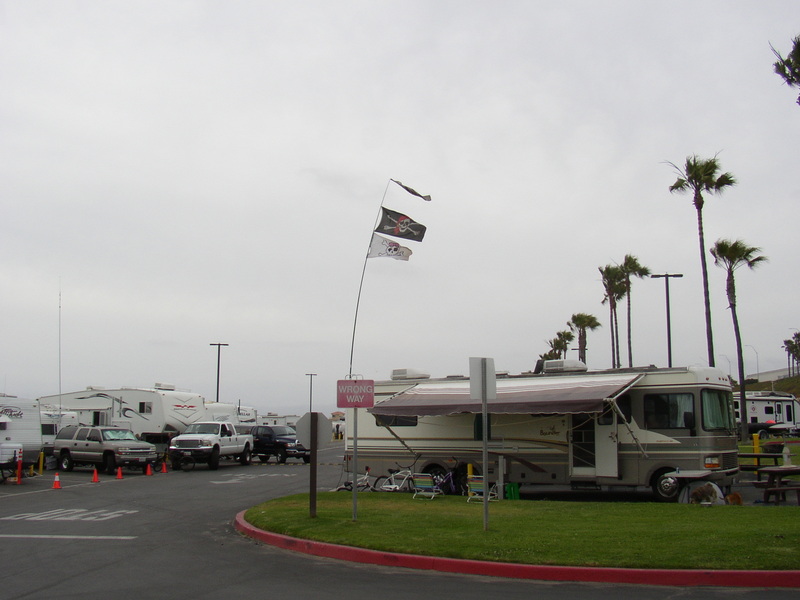 The location of the RV Park helps with that. 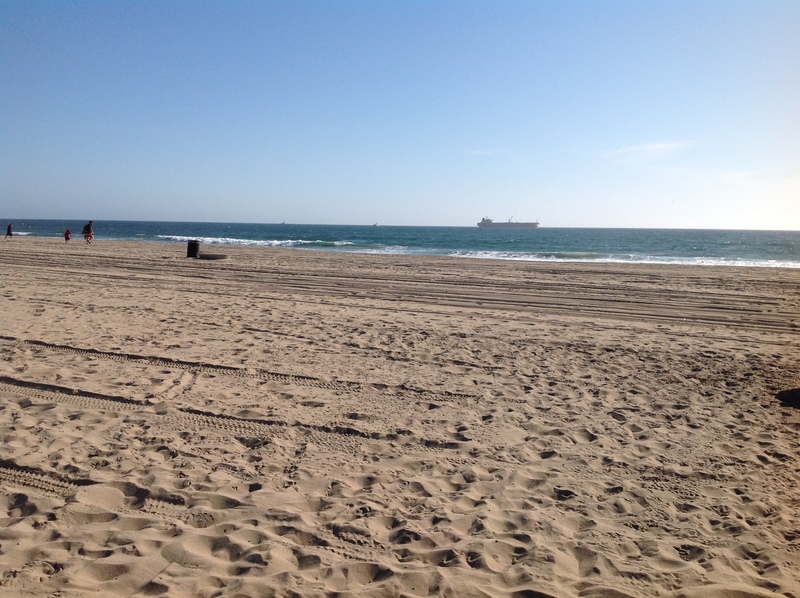 Dockweiler is a very large beach. 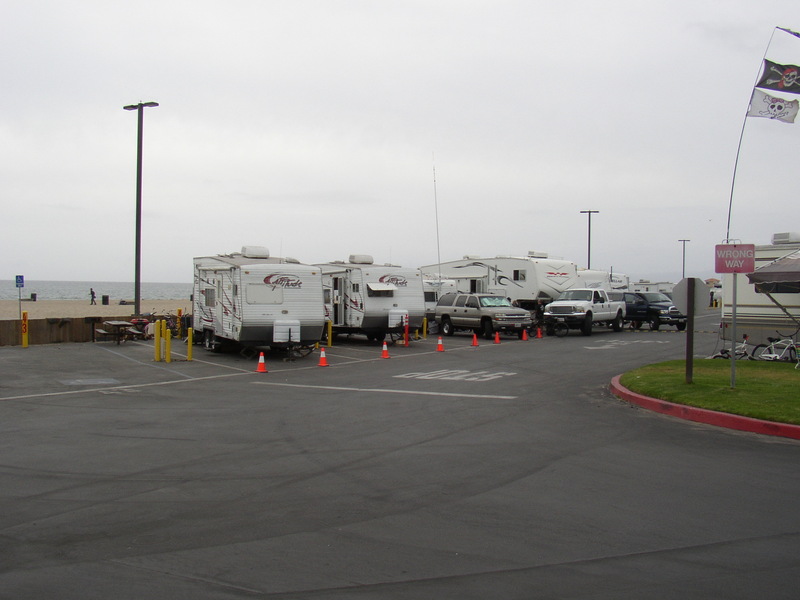 To the north of the guard shack is day parking ($6), and the “day use” part of the beach. That is where day visitors and surfers are. 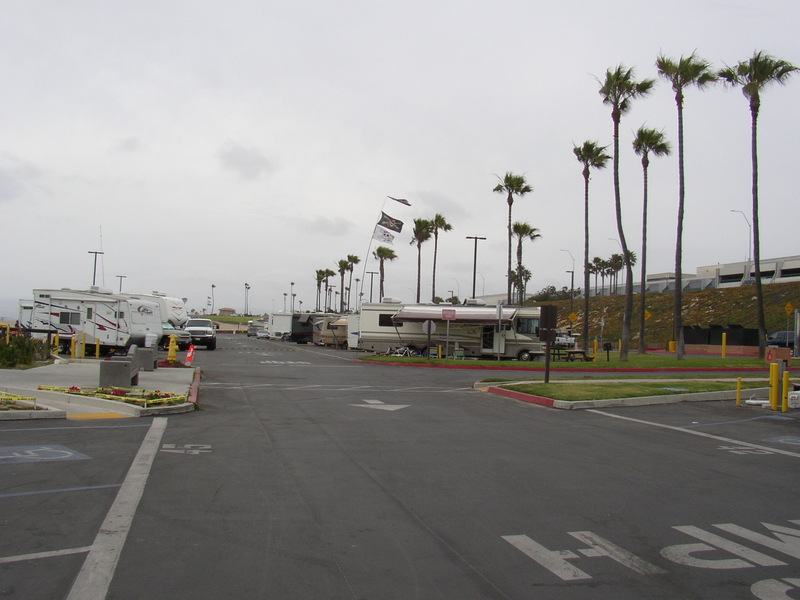 To the south of the guard shack is the RV park, but there is quite a bit of open ground between the day area and the RV area. Too far to lug surfboards and other beach equipment. 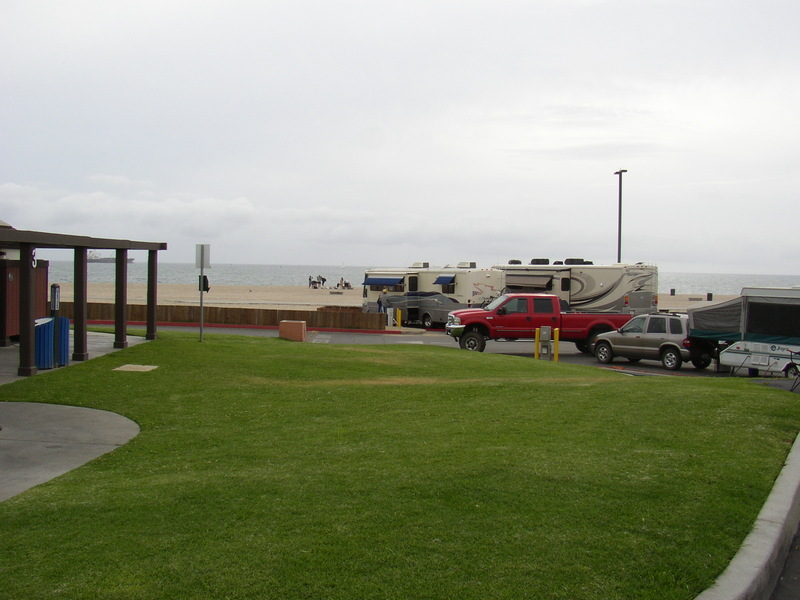 The beach by the RV park isn’t legally restricted to RV’ers, but the topography keeps day users on the north side of the beach. 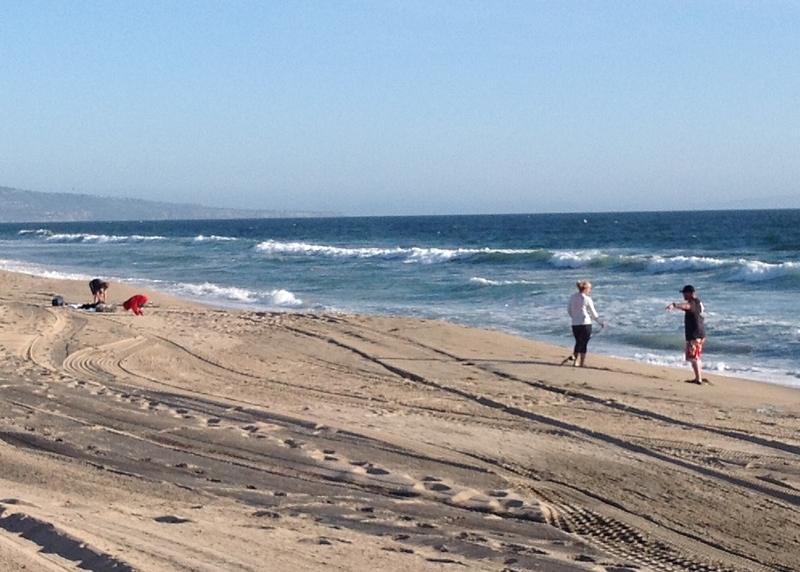 A nearly empty beach in SoCal…rare even in April. 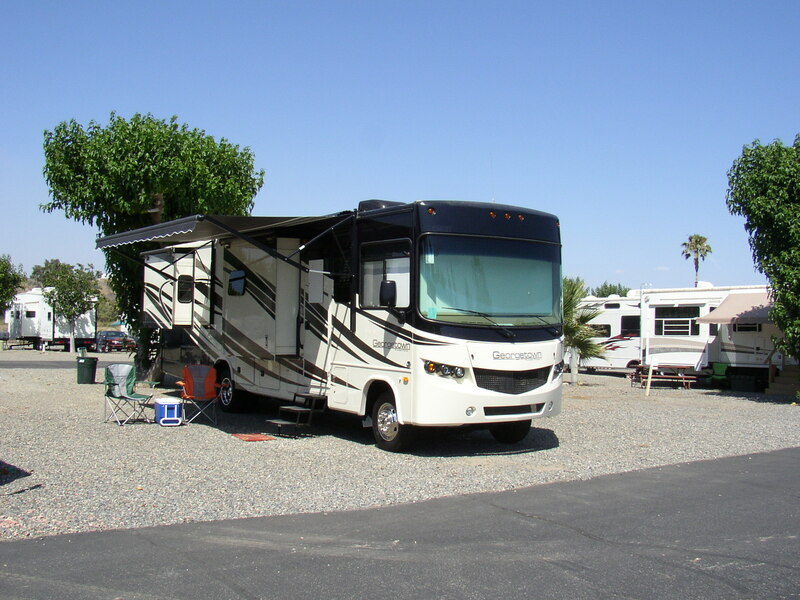 The first trip that we took in the new Georgetown 328 was a shakedown, at an RV Park that was only about 4 miles from the dealership and the storage yard. 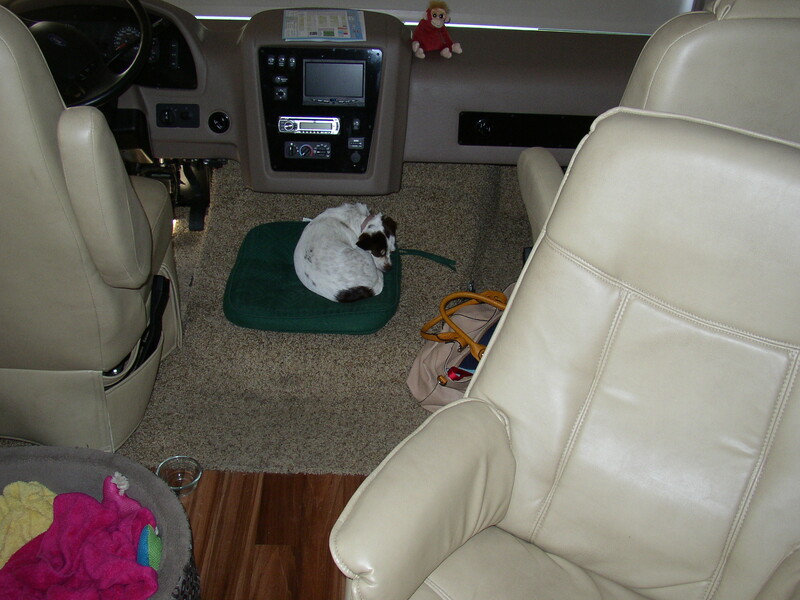 It was a great trip, but there was very little driving involved. This time we had more of a drive…about 70 miles one way. The driving was almost all freeway driving….you go about a mile from the storage yard to get to I-10. 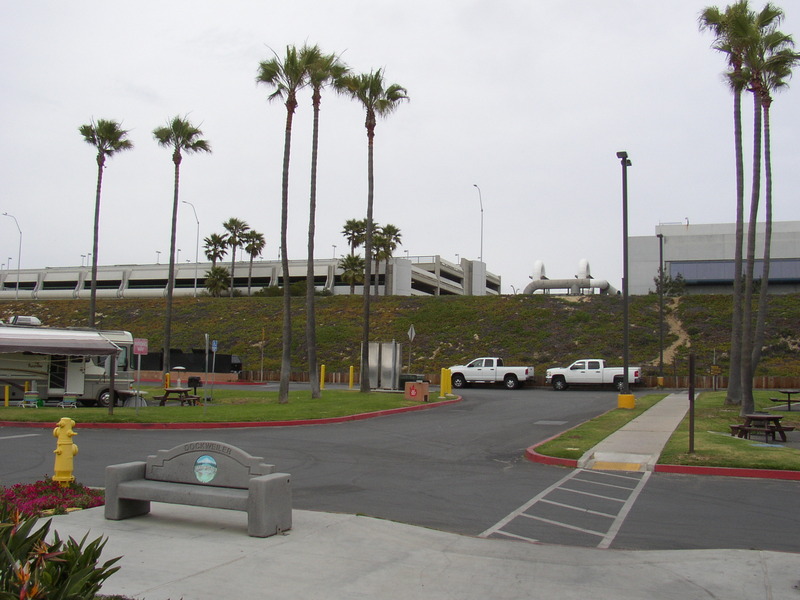 Then it’s over to the 605 freeway, and finally the 105 freeway. The 105 turns into Imperial Hwy. 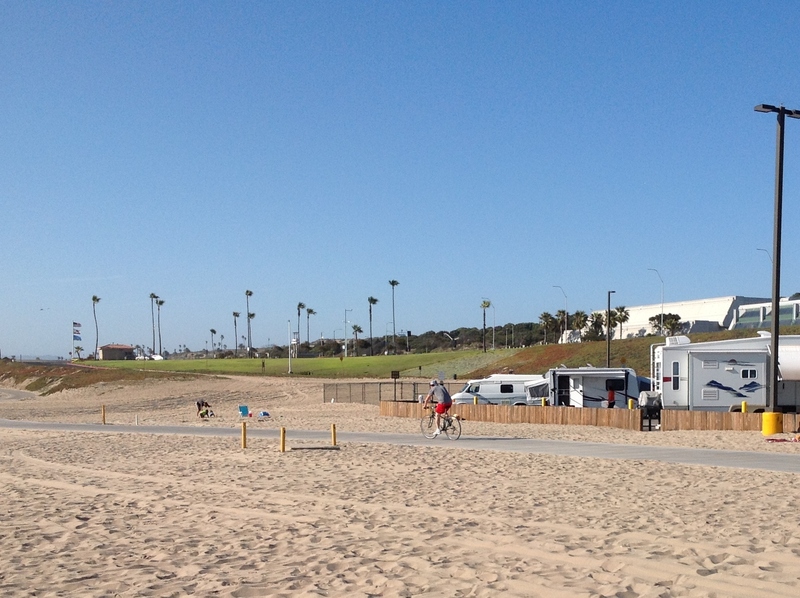 That road literally ends at the guard shack for Dockweiler State Beach, about a mile or two after the 105 ends. Our adventure started on a Thursday. Before we left the storage lot, I wanted to check and adjust the tire pressure. The sticker in the coach says that the tires should be set at 92 PSI. I checked the front tires and the rear inside tires. They were all set at 80 PSI. The rear wheels have wheel covers on them; those make it impossible to check the pressure on the outside rear tires. You have to remove the wheel covers to do that, but the little tool provided to undo the nuts that hold the wheel covers on didn’t provide enough leverage. Crap. I used my air compressor to set the front wheels to 92 PSI, and left the rears alone, not wanting to have the dual wheels set at different PSI levels. The drive down to the beach was easy. The new rig handled great! I-10 is an older freeway with a lot of big rig traffic, so it was the roughest ride. Even with that, I was able to drive the rig with one hand on the wheel most of the time, although due to the PSI issue on the rear wheels, I tried to keep my speed under about 60 MPH. The 605 freeway is a lot smoother than I-10, and was a breeze to drive on. The best was the 105 freeway, though. 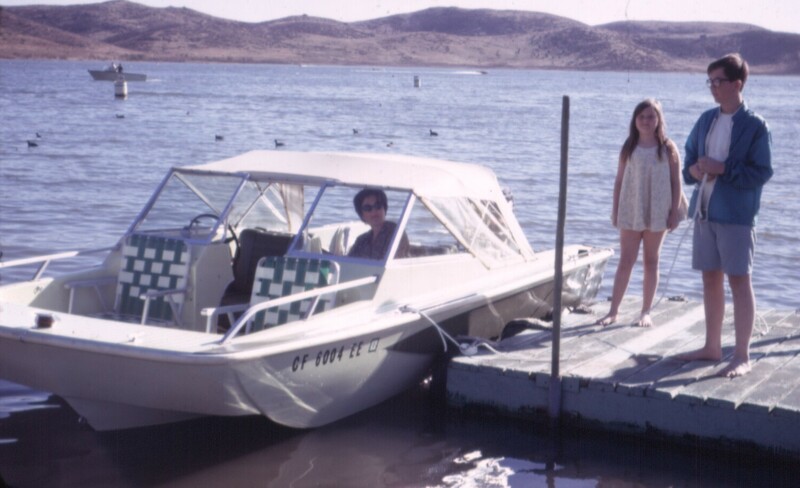 That one was built in the 1980s, and it is as smooth as silk. 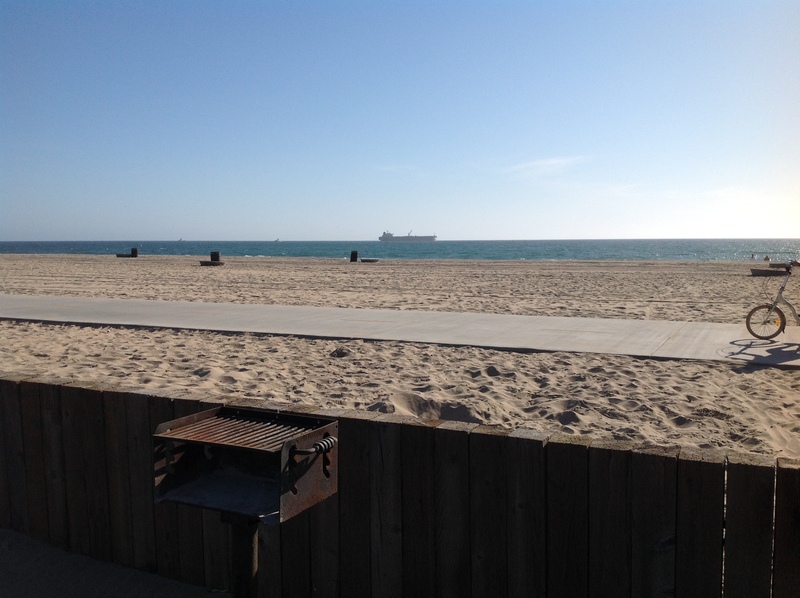 Dockweiler has a lot of little rules, and one of them is that you have to pay an extra $17 bucks to go in before the 1:00pm check in time. We were in no danger of getting there early, though. I had spent more time than expected trying to deal with the tire pressure issue. There was also more traffic on the roads than expected in a couple of spots. We pulled into the park a little after 3:00 pm. 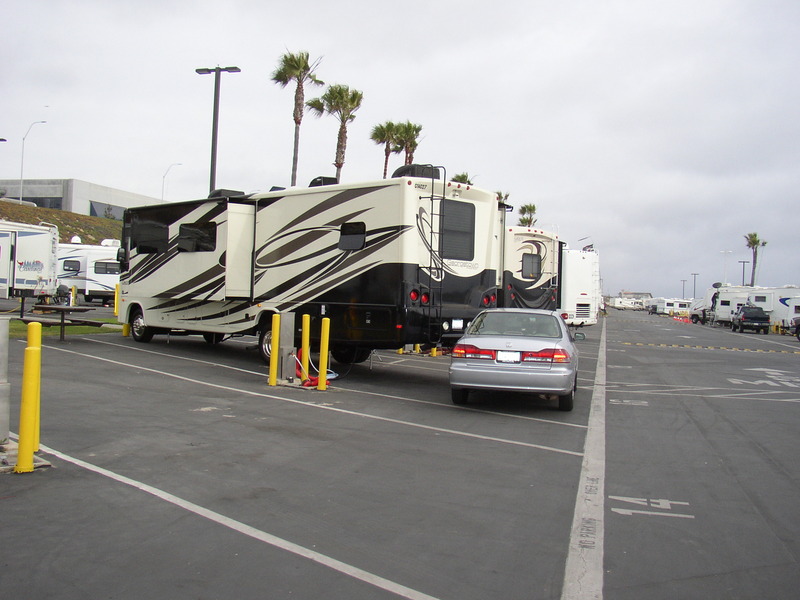 There were three rigs in line ahead of me when I pulled into the check-in processing area. Our spot was about halfway down the first block, in the middle isle. The spaces are angled but not pull through. They are generous in size, and easy to pull in to. I was able to pull our 34 foot rig in far enough to allow our car to be parked behind it. 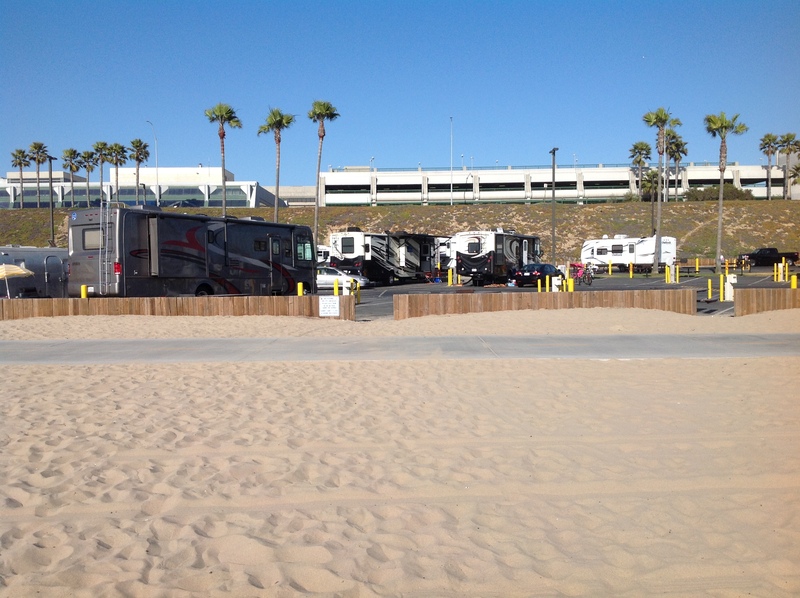 Already pulled into our spot. 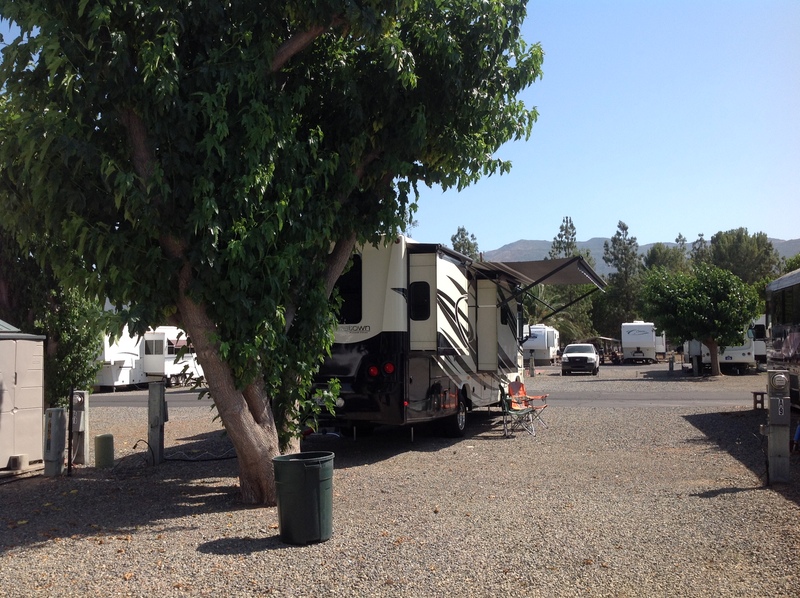 The spaces are full hookup, with 50 amp and 30 amp service, fresh water, and sewer inputs. 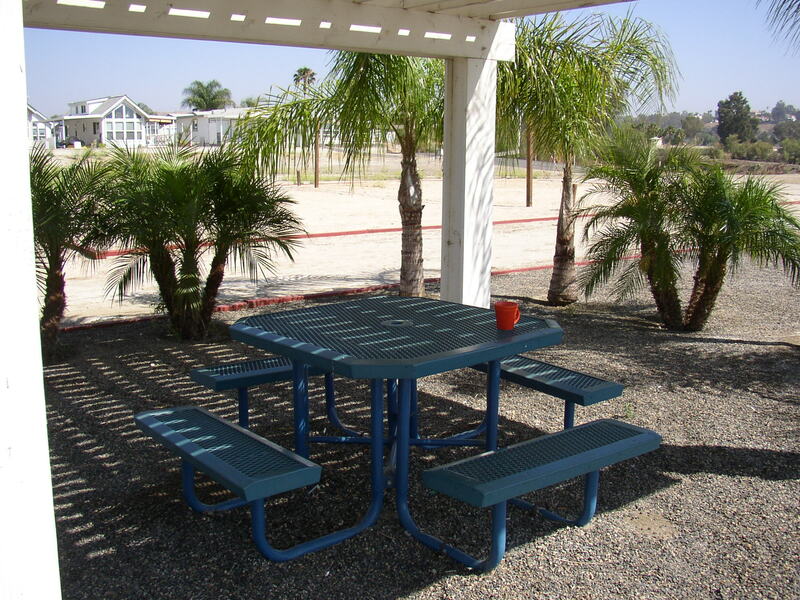 There is a picnic table for each space, and a simple BBQ. 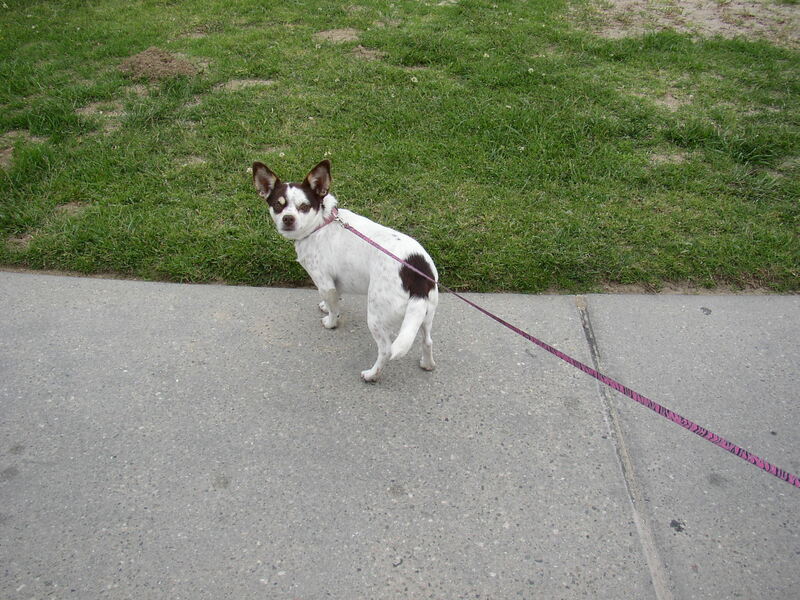 A strip of grass about 8 feet wide separates the middle spaces from the back spaces….this is a perfect place to walk your dog, but there are also special areas for dogs with waste bag dispensers, and two dog runs, which are in the sand and only big enough for one dog at a time. There is no cable TV, and no WiFi. Cellular reception and 3G/4G/LTE worked well on AT&T. Here’s a shot of the other end of the space, with the BBQ, table, and grass strip. 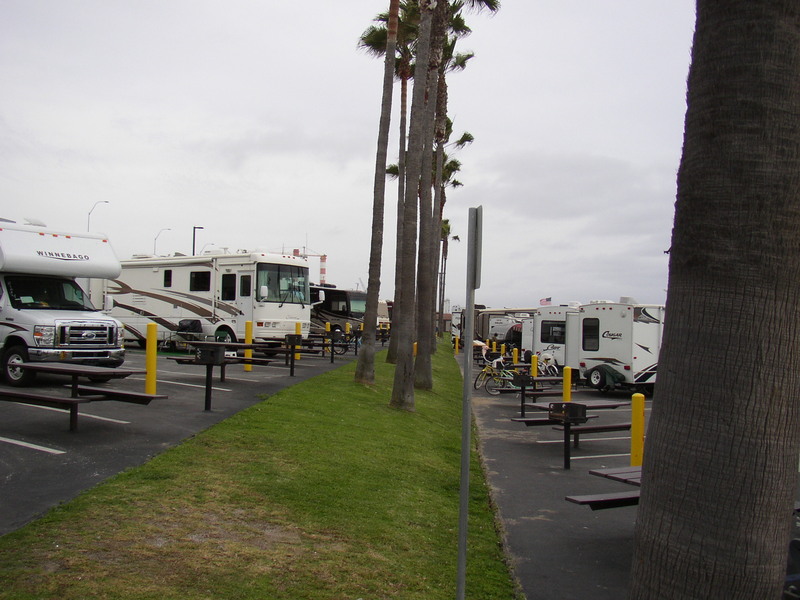 There are two bathroom/shower facilities for the RV Park, on either end, plus a public rest room to service travelers on the Strand. 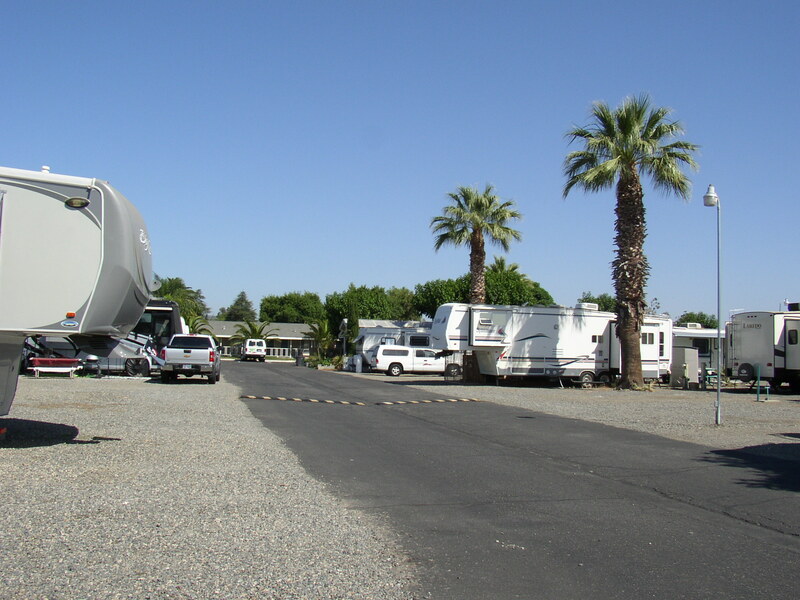 The RV Park facilities have a keypad entry. You get the code as part of the check-in process. 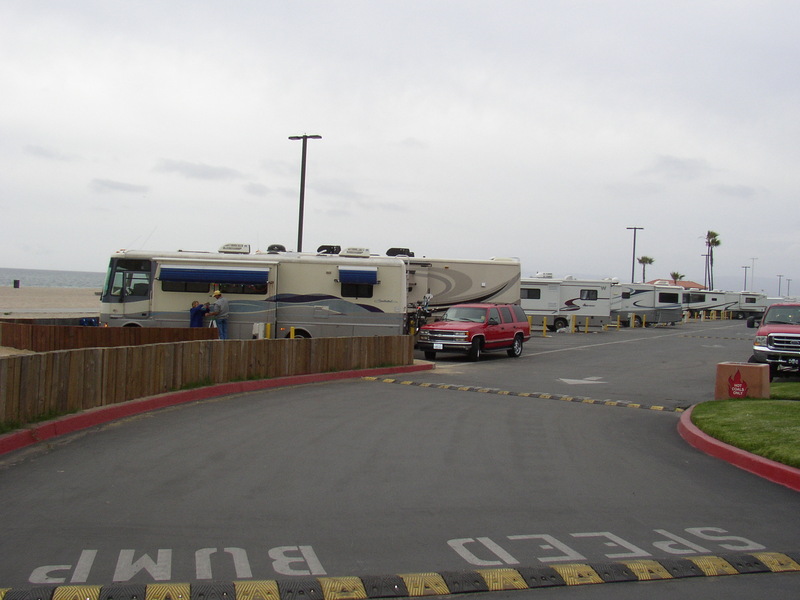 The public restroom is always open, and not nearly as clean as the RV park restrooms. 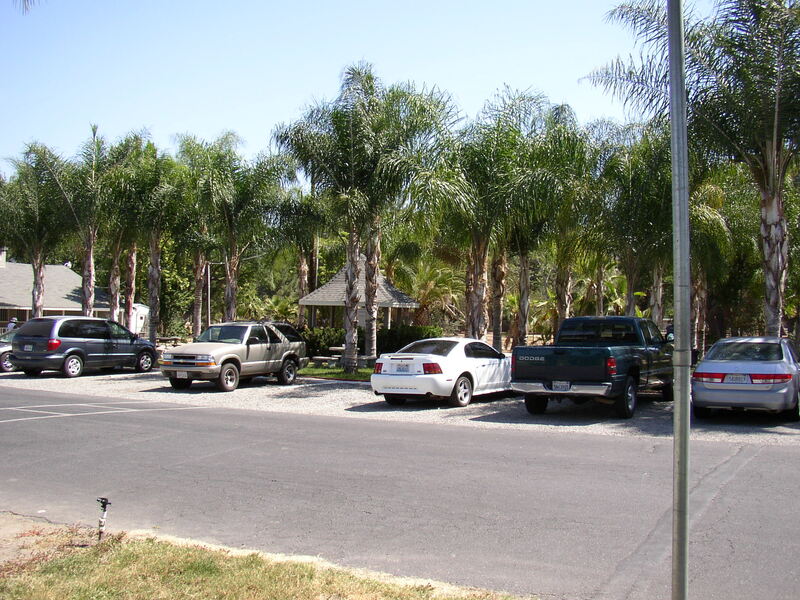 Planting is pretty simple…..a few palm trees and shrubs, along with the grass. No shade trees. Palm Trees on the grass between the middle and back rows. After getting set up at the park, Laura and I were both pretty beat. Time to have a drink and relax. 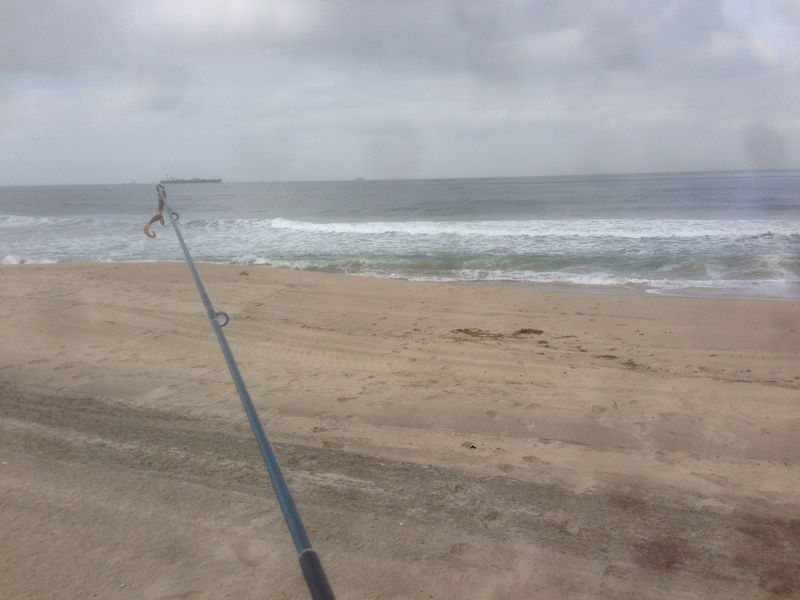 Then I spent a little time in the late afternoon trying my hand at surf fishing, but it was a tad too windy to get my bait out far enough. There was a family trying their hand at the time I was out there. Nobody was having much luck, but I’ve fished around here quite a bit over the years, and have had good luck many times in the past. The fish are there more often than not. After a while, it was time to get back to the coach. I picked up my tackle and headed back in. The water is about 100 yards from the park at high tide. Getting ready to head in for the evening. Laura made some of her famous Melange for dinner….eggs, peppers, onions, potatoes, cheese, and sour cream, topped with a little hot sauce. Then we turned on the TV. There is good HD reception over the antenna for Channels 2 and 7, and also PBS and a few other stations. Thursday night is an ABC night for us, so using the antenna was perfect. The next day (Friday) was busy. 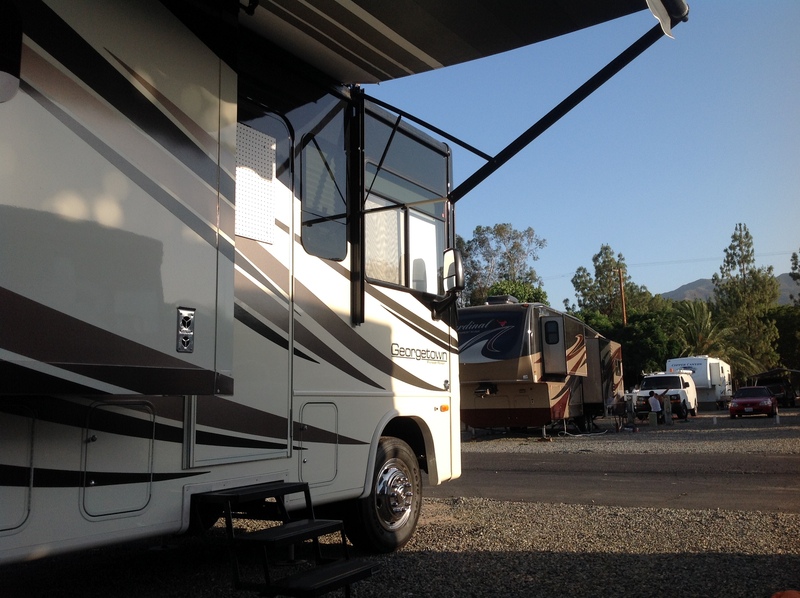 We came to a close RV Park for a couple of reasons. 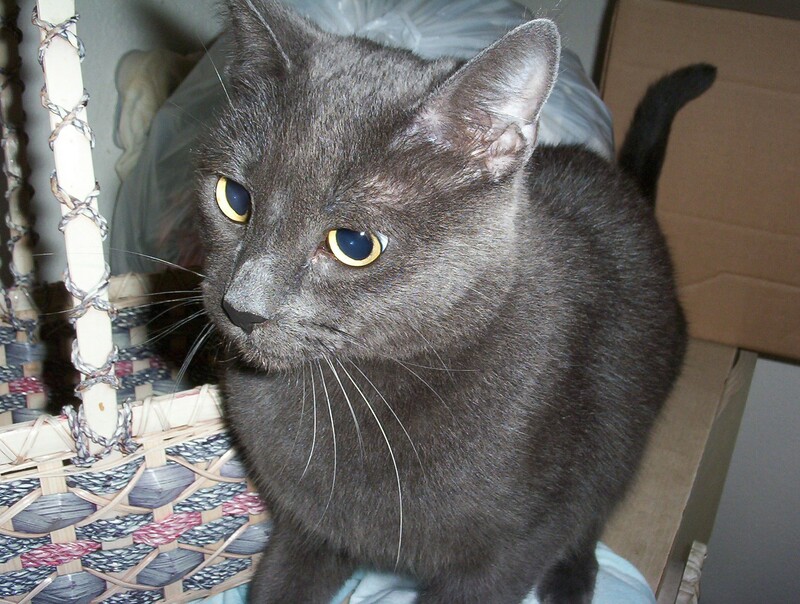 One reason was stocking…..being close to home and the stores that we frequent is helpful. 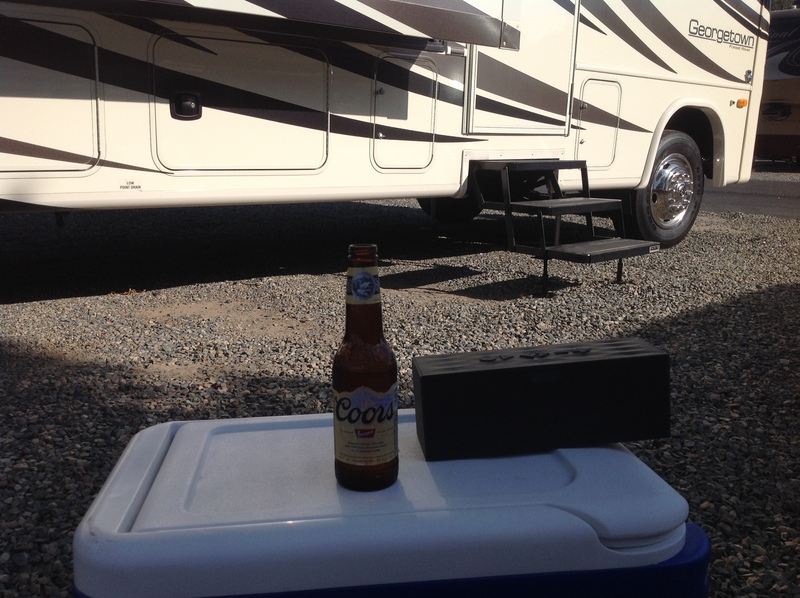 We also wanted to have a small get together at the coach, to show it to the family. 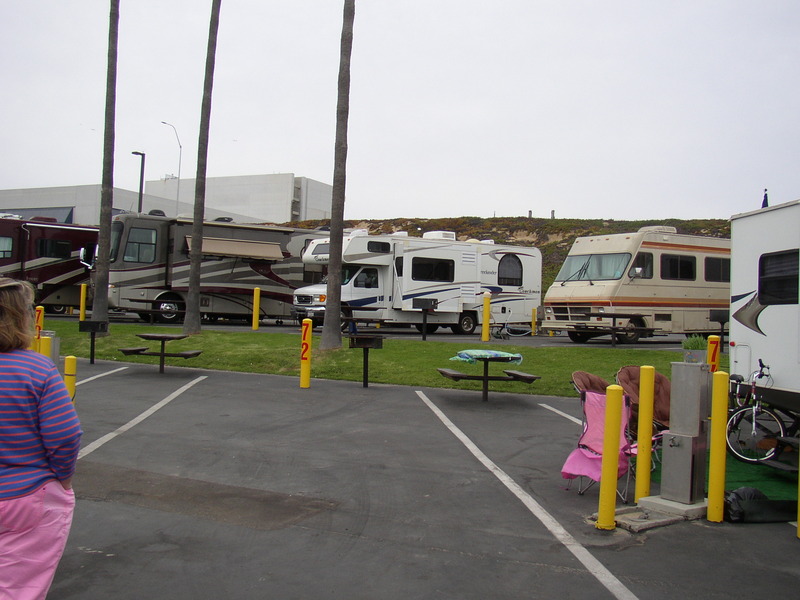 They all live within about ten miles of Dockweiler. The party was planned for Saturday. Friday was stocking day. We did some shopping at Walmart in Torrance, and also brought some items to the coach from home. The weather was nice on Friday. 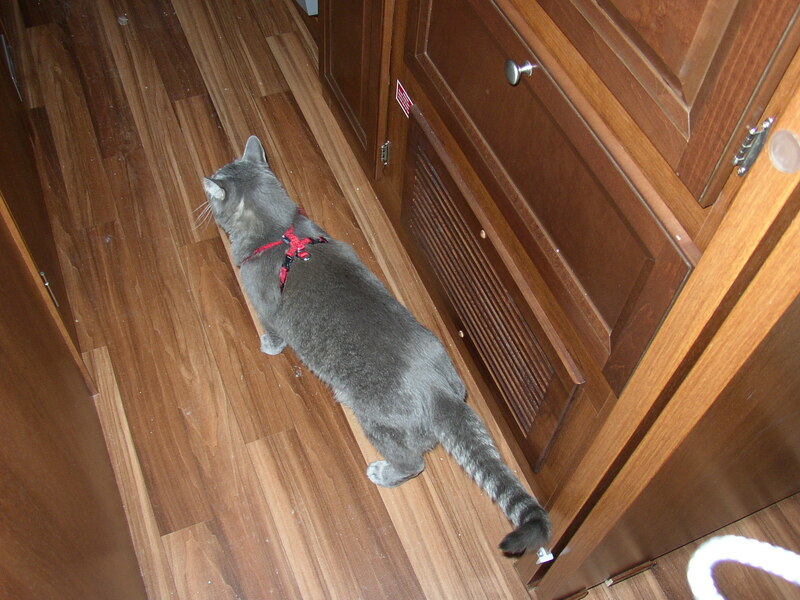 I did some more fishing in the morning, and had better luck getting my bait out to where the fish should be. I got one good strike, but that was it. Skunked again. Laura and I did have fun walking the dog around, and exploring the park. Here are a few pictures from our walks. You can see the clouds rolling in on some of these shots. Later in the day, Aaron, Jennie, and Elliot (my son, his wife, and daughter) paid us a visit, and we had a really nice time. While they were there, the wind started to pick up. About twenty minutes after they left, we got hit with a fairly heavy rainstorm that lasted the rest of the evening. 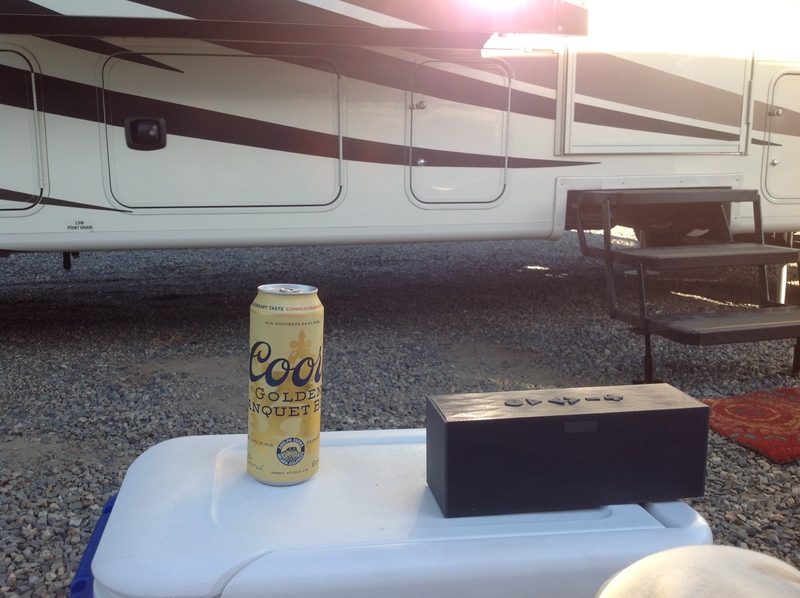 The wind was strong enough to rock the coach all night, even through we had our leveling jacks down. 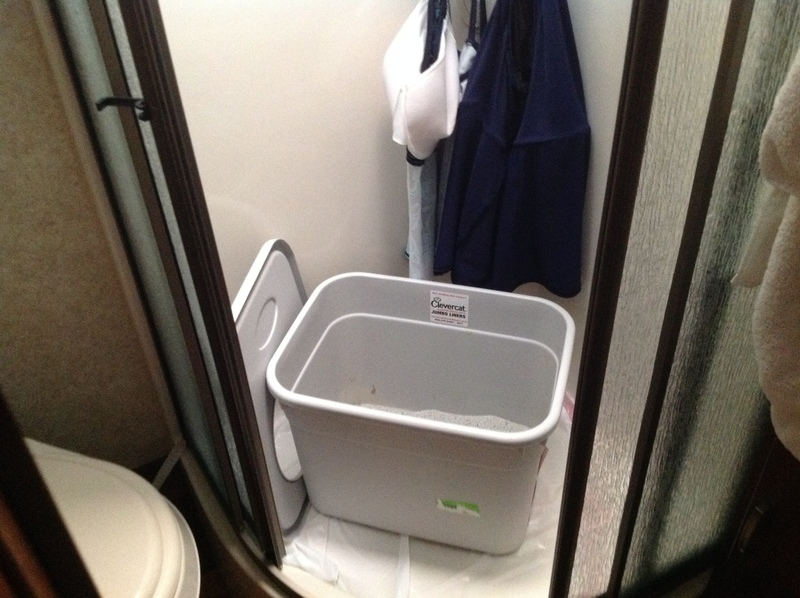 This storm was a good test of our new rig….no leaks that we could find. Come Saturday morning, the rain was gone, but the wind was not. It was blowing really hard…..way too hard to do any fishing, or even much walking. That was OK, because we needed to prepare for our party. 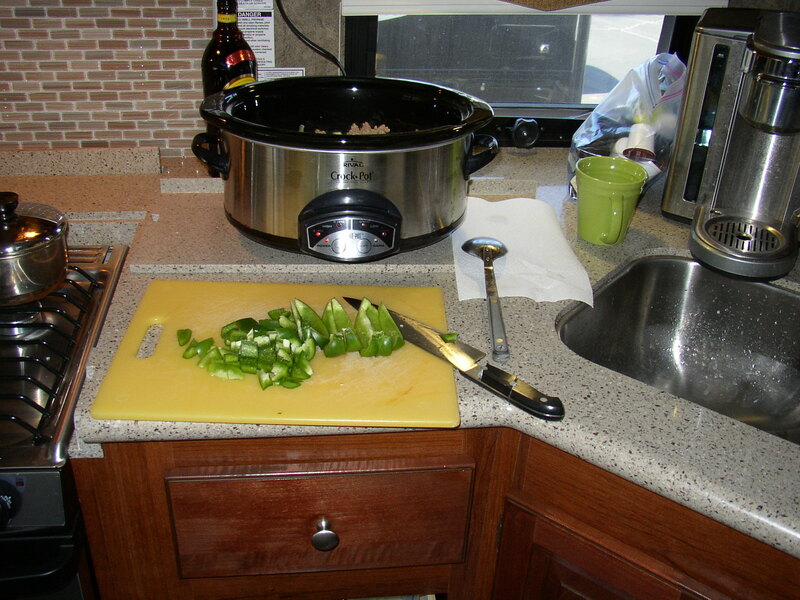 The big job was getting the chili going in the crock pot. Chili in the crock pot, cooking. The party was a success, even though it was too cold and windy to be outside of the coach. The family seemed to enjoy it quite a lot, and Elliot was a joy, giving plenty of attention to everybody there. We had four generations of the family all in the coach at the same time…..Great Grandparents, Grandparents, Parents, and child. Three of my four sons were there…..it was so nice to see everybody. 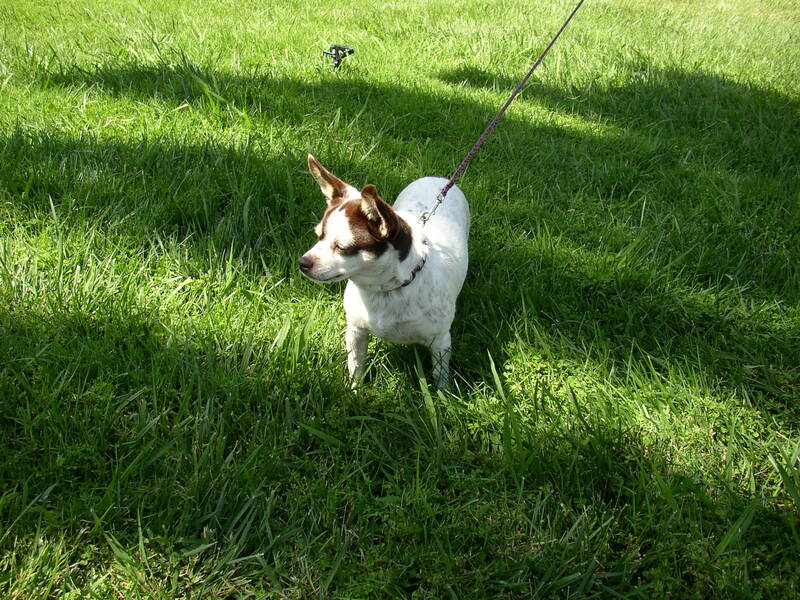 Our dog was nervous, but she was well behaved most of the time. Laura’s friend Lani showed up too, and brought some Chocolate Wine. After the party, Laura drove her mom and my parents home, and then we cleaned up the coach. We had a nice quiet night after that, except for some raucous partying going on here and there around the park. It was still windy and cold outside, but since there was no rain this night, people seemed to be making up for the rained-out parties of the prior night. Sunday morning was beautiful. The wind was gone, and we had sunshine and clean air. Checkout time is noon, and we had a lot of work to get done, so it was a busy time. Back to the wheel covers and tire pressure. I put some questions about my problem onto the Forest River Forum, Georgetown section. I got a lot of great responses. I wasn’t the only person who couldn’t get the retaining nuts loose with the special tool provided by Forest River. The suggestion was to use a breaker bar and socket with extension. I had those at home, and picked them up during one of our supply runs. That did the trick….I got the wheel covers off, and was able to check and adjust the PSI on the rear tires. Now all tires are set at 92 PSI. We had the coach ready to go at about 11:58, and left for the long drive back to the Storage Yard. I was able to keep the speed up at 65-70 MPH during most of the trip, now that the tire pressure was correct. The increased PSI made for a harder ride, but handling was more positive. 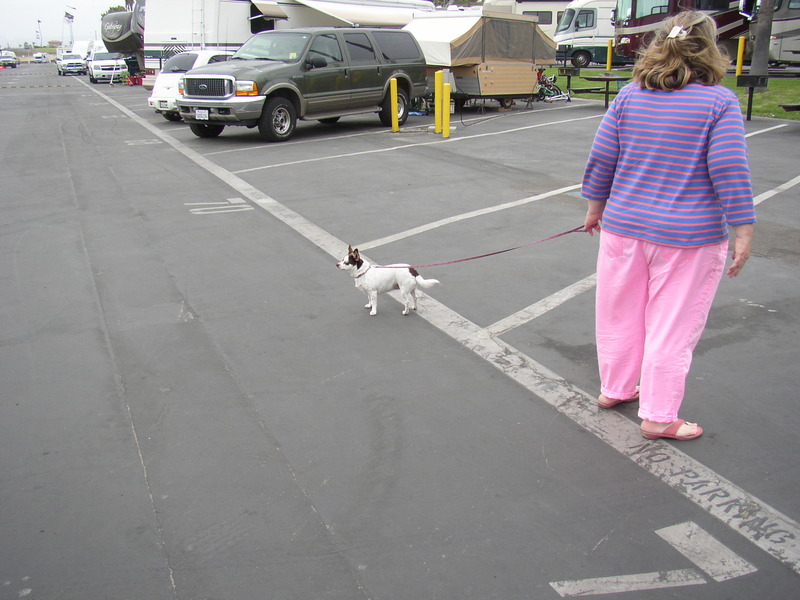 The drive went well, and it was easy to get the coach pulled back into our storage spot and buttoned up. 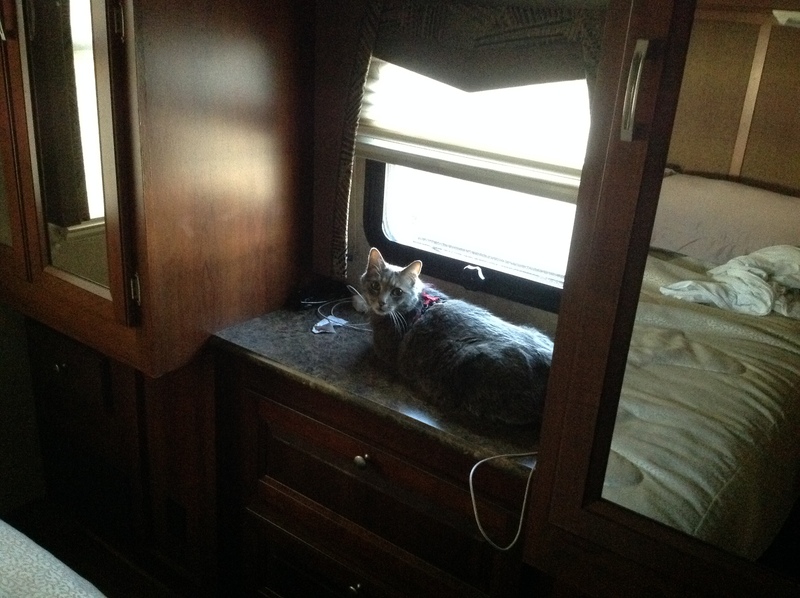 I think our second RV trip was a great success. The coach worked flawlessly. I keep wondering when all of the defects are going to show up. I haven’t run into anything yet that would require a trip back to the dealer for warranty service. There are a few small issues. The door is a little hard to close. Some screws on the handle were loose. I tightened those, which helped, but I think I need to adjust the door jamb to align better. I think the grey water tank valve leaks a little bit, too. When I removed the cap over the dump pipe, some grey water came out. Good thing I was wearing my rubber gloves! But that was it…..no other problems. Can’t wait to get back out there. We are probably looking at mid-May for the next trip. We are getting ready to embark on our second trip in the Georgetown……or Curious George as Laura has named it. 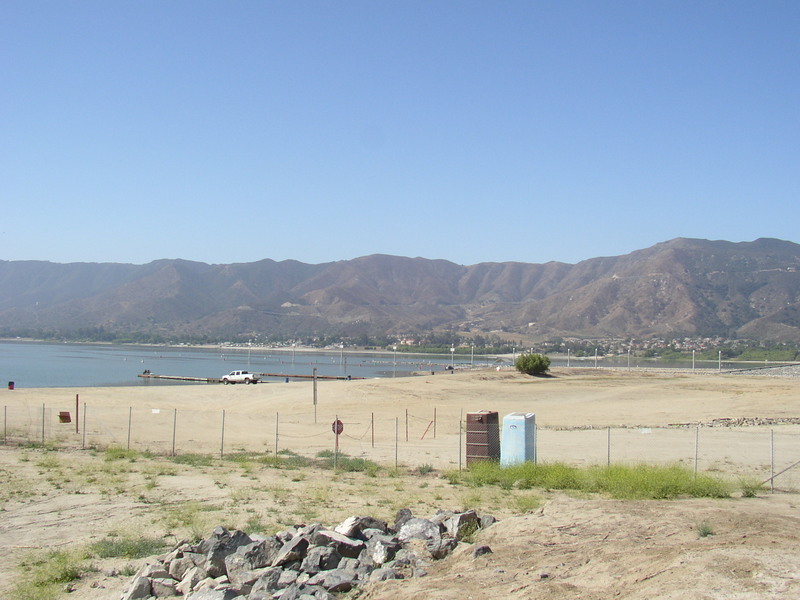 We are going to Dockweiler State Beach for a few days. 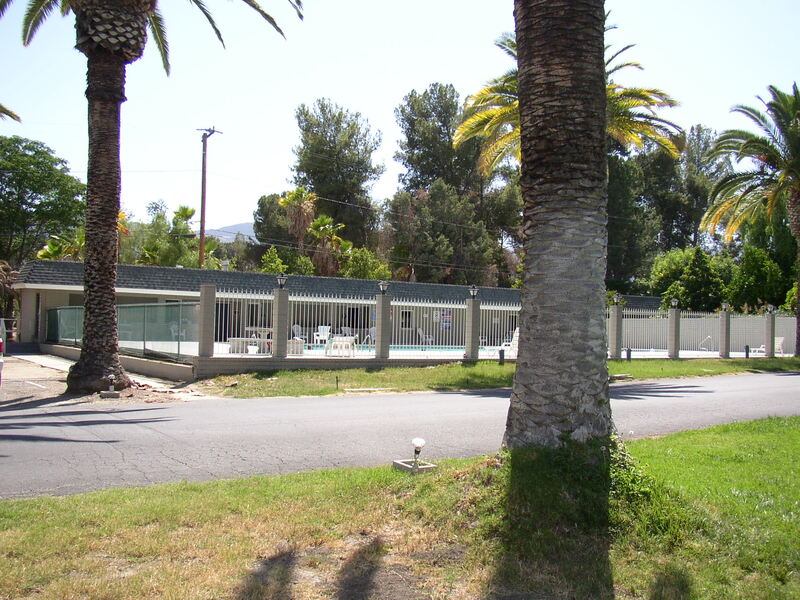 This will be the first significant drive we will take….it’s about 60 miles one way from the storage facility. It’s only about 5 miles from our “sticks and bricks” house, so we can spend some time stocking, and also have the family over for a small get together. 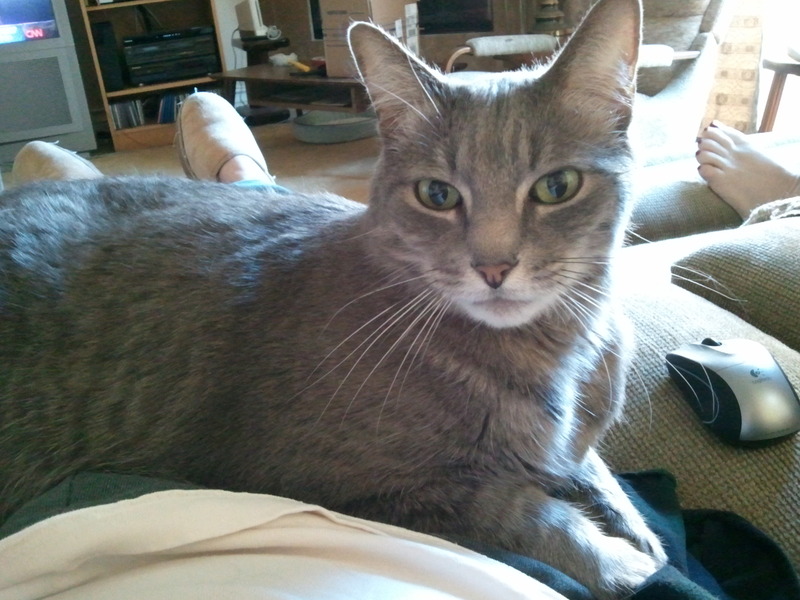 It’s close enough that we don’t have to ask one of the kids to feed the cats….we’ll just drop by home and do it ourselves. All the jitters are there. Will the batteries be dead after the coach sat for almost a month? Will I run into problems checking tire pressure, oil, and other things before leaving? How will the drive be? Will anything go wrong? How will hosting a party out of the coach work? Reading forums about the Georgetown line also gives me the jitters. I have read about problems with the awning, problems with the bedroom doors, problems with the steps in front of the door, and other issues. Is our coach going to fall victim to any of those problems? 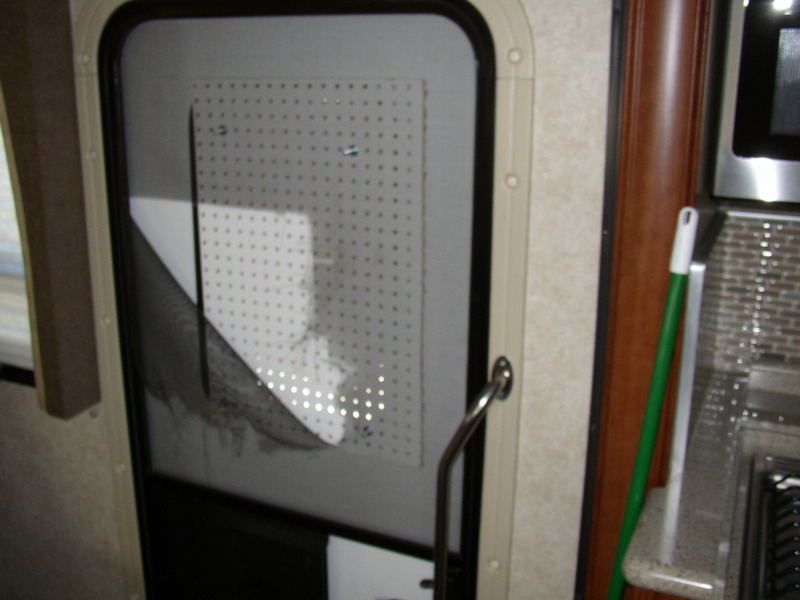 It seemed really solid on our first trip, but we didn’t create much wear and tear in such a short time. There is also the excitement. Our first trip was only a couple of nights, and it was mainly a shakedown trip, although we had a good time talking to the nice folks there.This destination is more interesting than the first trip. 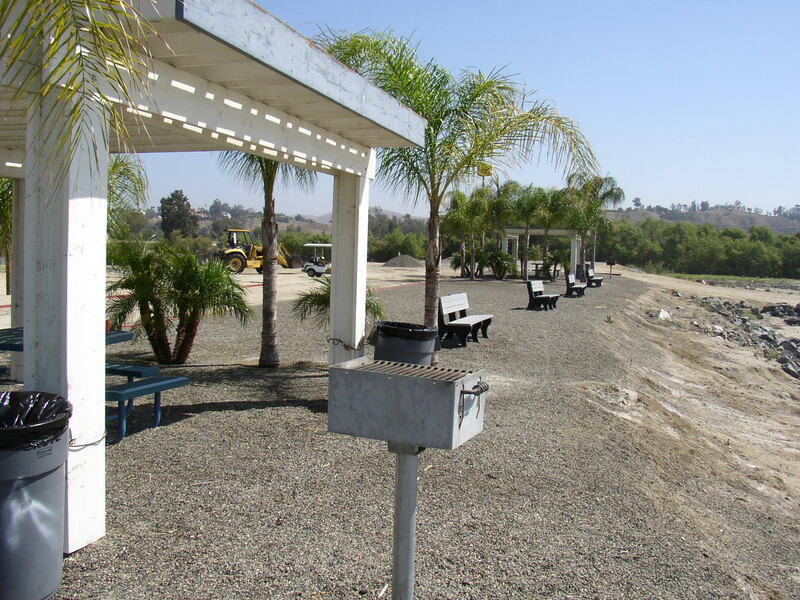 We will be right on the beach, not in an industrial area next to a landfill in the Inland Empire. 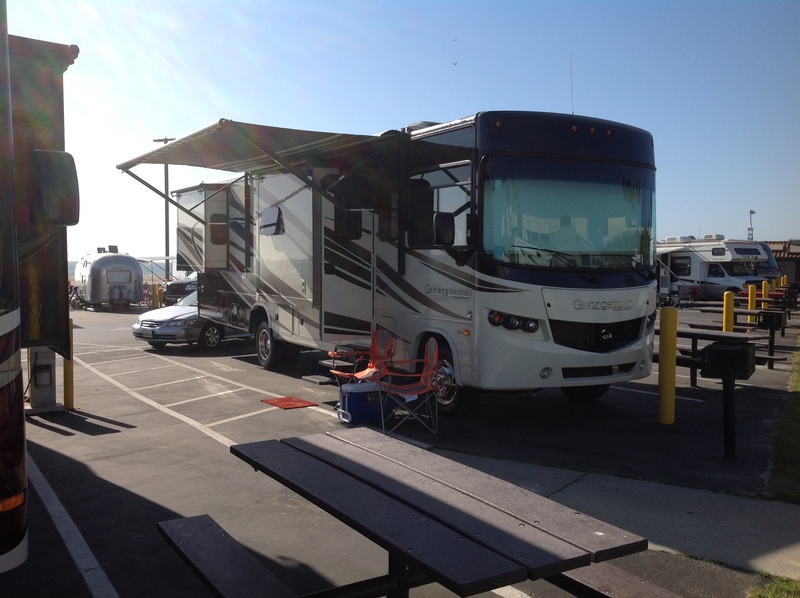 This trip will be three nights….not much longer than the first trip, but enough time to enjoy the beach, do a little surf fishing, do a little writing, and just exist in our new home away from home. I’m really excited about that. There will still be some shakedown involved, but that won’t be the main focus of the trip this time. I’m a “check lists” person, and have already been working through items. This afternoon will be busy for both Laura and me. 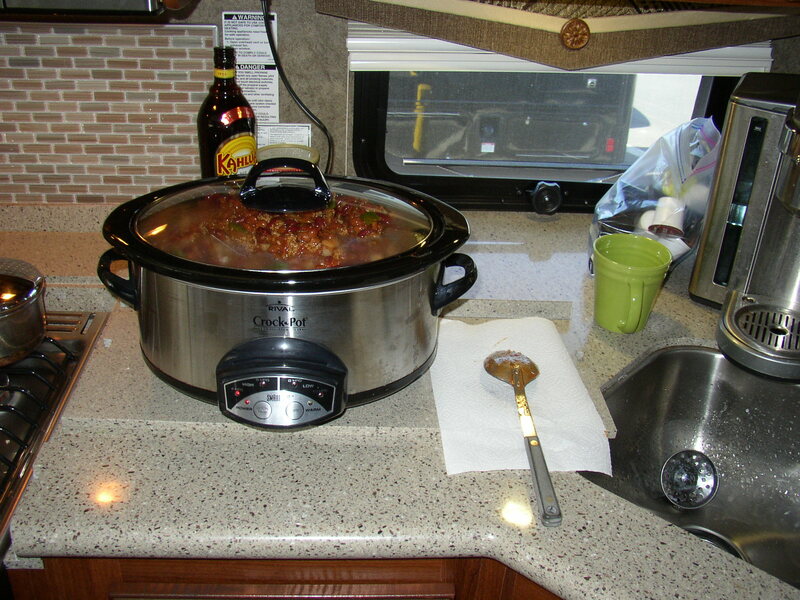 Packing, loading the car, grocery shopping, loading the ice chest, charging up electronics, precooking meat for chili. We’ll be tired by the end of the day, which will hopefully help us to get a good night’s sleep. So Curious George gets its first outing with the new name. Wish us luck!